Your baby should sleep on his back. This is vital, it must happen every time. If you are concerned about choking, know it is very rare. Healthy babies tend to swallow or cough up fluids automatically. However, if your baby suffers from chronic gastrointestinal reflux or from an upper airway malformation, talk to your doctor about the best sleeping position for your baby. Once your baby is able to roll over, which happens around 6 months, let him choose his sleeping position. 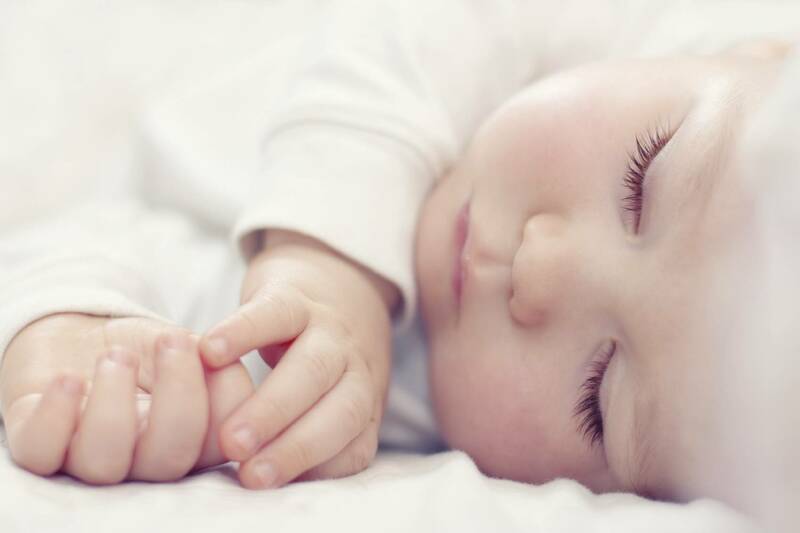 Your baby should sleep on a firm bed, with no toys or bedding. Always lay your baby on a firm mattress and avoid any pillows, quilts, bumper pads, or stuffed toys. These items can hinder your baby’s breathing. Keep your baby away from cigarette smoke. This also goes for women who are pregnant. Smoking while pregnant has shown to increase the risk of SIDS. Have your baby sleep in his own crib, but in the same room you sleep in. Your baby can be in your bed for comforting and nursing, but when he is ready to sleep, he should be placed in his crib close by. Breastfeed as much and as long as you can. Studies have shown that breastfeeding can help reduce the risk of SIDS, specifically due to its protective agents that fight off respiratory and gastrointestinal infections (common contributors to SIDS). Immunize your baby. Recent evidence suggests that babies who receive their immunizations have a 50% lower risk of SIDS. Consider using a pacifier at nap or bedtime during the first year. Using a pacifier decreases SIDS risk. However, it’s not necessary to take it to an extreme: if your baby’s pacifier falls out of his mouth after he falls asleep, you don’t have to put it back in. If you are currently breastfeeding, wait until your baby is 1 month old so you have time to establish an effective routine before you use a pacifier. Don’t let your baby get too hot. The room should be at a comfortable temperature, not too warm and not too cold. Make sure you dress him in no more than one layer of clothing! Do NOT use products that claim to reduce the risk of SIDS. Products such as sleep positioners, special mattresses, and sleep surfaces have not been shown to reduce the risk of SIDS. Don’t give honey to babies under 1 year old. Honey can lead to botulism, which can be deadly in itself, but it also contains bacteria that has been related to SIDS. Although researchers still don’t know the exact reason why the risk of SIDS is reduced after 6 months of age, it may be related to the baby’s physical development, more specifically, the baby’s respiratory control, metabolism, sleep patterns, and physical skills. In fact, by the time your baby is able to roll over, which happens when he is about 6 months old, his brain will be mature enough to alert him about breathing dangers and, given that he has more physical control, he can rescue himself from certain dangerous sleeping positions. As can be seen, one of the best weapons against SIDS is for your baby to have control over his body and be able to roll from one side to the other. If your baby has the physical strength to change position, the possibility of him not being able to breathe diminishes greatly. If you want to teach your baby how to roll over and strengthen both his neck and core muscles, try this Kinedu activity! As can be seen, one of the best weapons against SIDS is for your baby to have control over his body and be able to roll from one side to the other. Remember that your baby should always sleep on his back!